I actually bought a kit this week! I'd been seeing layouts with this kit prior to it's release and LOVING every single one of them. I got my newsletter from one of the designers on this collaboration and she had a 30% coupon, plus a FWP offer on it. I just couldn't resist. I mean, it was just so perfect for the fall pictures I had just taken of the kids. I seriously LOVE how this turned out! I think I used practically everything in this MEGA kit including all the FWP overlays LOL. I get my money's worth out of kits, LOL. 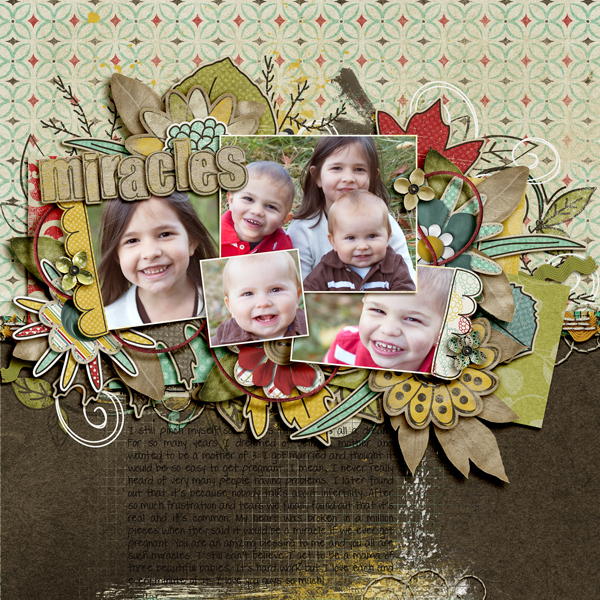 Anyways, here's the layout I did with it, using a fab template by Darcy that's inspired by one of my fave scrappers. To say that I love me some Laura would be an understatement.